Waiting for your customers to pay up is a pain -- and it could hamper your small business's cash flow. That's why invoice factoring, which gives you a cash advance on outstanding invoices, is a valuable financing option for many small-business owners. It's especially useful for those who run B2B companies -- ones that sell products or services to other businesses. If your company routinely deals with a high volume of invoices, factoring is a convenient way to access financing that could help ease a cash crunch. But the system can be complex, and mistakes could do serious harm to your business. Here are six errors entrepreneurs make with invoice financing and how to avoid them. 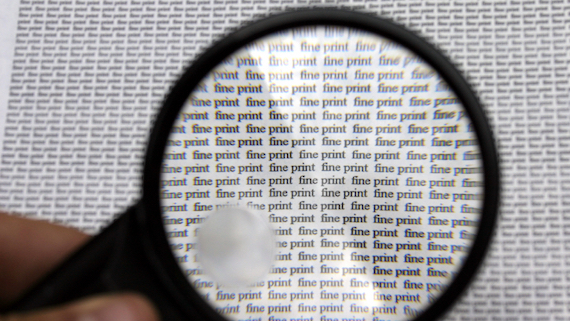 Just like with any financing agreement, you have to read the fine print when it comes to invoice factoring. Be on the lookout for any fees beyond the factor rate. With invoice factoring, you sell your unpaid invoices at a discount to a factoring company in exchange for immediate cash. The factor rate determines the total fee you pay for an advance on outstanding invoices. For example, if the factor rate on a $10,000 advance is 3%, you'll pay the invoice factoring company $300. Factor rates typically range from 1% to 5% and often depend on your company's revenue, says Edward Castano, vice president of marketing at BlueVine, an online factoring company. For a small business with monthly receivables of $50,000, a factor rate of 5% to 6.5% "would be fair," he says. But some invoice factoring companies don't play fair. Small-business owners should pay close attention to any extra fees, Castano says. "Some companies may have a fee for checking your credit score, monthly subscription fees, or fees for early repayment," Eyal Shinar, CEO of online invoice financing company Fundbox, tells NerdWallet. Castano says some companies bury descriptions of these fees in the small print, "making them easy to miss during the application process." Factoring has been a business financing tool for centuries, but it can still take time for small-business owners to understand how it works. A common error is misdirecting payments so that you are receiving payments that should have gone to the factoring company. "Invoice factoring requires you to set up a new bank account or redirect payment to the factor, and you have to let your customers know which bank account they should pay depending on which invoices you decide to factor," Shinar says. "A small-business owner's customer might make a payment to the wrong account, and factoring companies might charge a fee for this." Miscommunication involving who gets paid for the invoices could lead to issues that cost you, says BlueVine's Castano. "This will not only hurt your relationship with your factoring company," Castano says, but also "might trigger penalties and lead the factoring company to terminate the relationship." Another no-no is submitting purchase orders as invoices. These orders represent services or products that have not yet been delivered. "Sometimes people do it because they don't understand how the system works," Castano notes. "A purchase order is a commitment to purchase. They can't be factored. It doesn't represent revenue owed to them." Remember that some invoice factoring companies actually take over collection on your outstanding invoices. This entails lots of time-consuming paperwork. "Though these are not hard dollar costs, the time involved is still an opportunity cost that a business owner should consider when selecting its financing partner," says Ethan Senturia, CEO of alternative lender Dealstruck. You have little flexibility with some traditional factoring companies, which require you to submit a minimum volume of invoices to be factored. Today, online small-business financing companies are using technology and access to a wealth of data to offer a more flexible variation on factoring: invoice financing. Invoice financing companies do not actually buy invoices. Essentially, they use the invoices as collateral to advance you cash. Remember that invoice factoring or financing is mainly for B2B firms that generate a lot of unpaid invoices, such as manufacturers that sell products to corporations or government agencies. It's not a good fit for consumer-focused small businesses, such as retail shops or restaurants. Invoice factoring, invoice financing and other forms of accounts receivable financing are typically more expensive than traditional bank loans, especially those guaranteed by the SBA. For example, BlueVine financing carries an APR of 17% to 60%, and Fundbox's APRs range from 44% to 64%. The annual percentage rate of interest for SBA loans, in comparison, is less than 10%. But accounts receivable financing is easier to access, making it good for short-term business needs. For longer-term financing needs, however, invoice factoring is not always ideal, especially for small businesses that are just starting out or have low profit margins. "If you have a strong business, factoring can help you," Castano says. "If it's weak, it can put your business in a downward spiral." That's because the cost of the financing could erode much of your small business's value in the long term, hampering your growth. Explore your options as a small-business owner, Castano says. If you can get a good deal from a bank, some of which also offer factoring services, "you should definitely take a bank credit first and use [factoring] to supplement that." Shinar of Fundbox, which provides invoice advances, but does not consider itself a factoring company, says small businesses that go through seasonal fluctuations in their industry could use invoice financing to "remain cash-flow positive during off-peak times." But it all depends on the health of your small business, he says: "Small-business owners can potentially misuse this type of financing, or any type of financing, if they do not have a solid grasp on the overall health of their business." To get more information about funding options and compare them for your small business, visit NerdWallet's small-business loans page. For free, personalized answers to questions about financing your business, visit the Small Business section of NerdWallet's Ask an Advisor page.